Description : Ripple9’s mission is to enable musicians to reach the broadest audience possible, and to be appropriately rewarded. 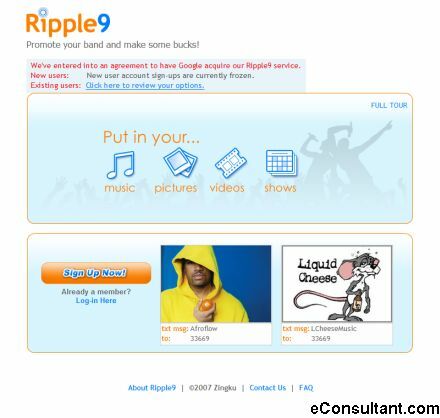 Ripple9 helps you promote your music as effectively as possible in a digital world: get your music in your fans pants, remind fans to come to your gigs, accelerate and manage the growth of your fan list. The service takes advantage of the fact that every one your fans, or fans-to-be has a mobile phone in their pocket , and that they know how to send and receive text and picture messages.